You probably know that to get formal Emergency Medical Technician training or EMT training, you need to know certain things. You need to know the requirements that you need to have and what specific training program you want to take. At the very least, you need to be a certified EMT Basic before you can take advanced EMT training. You have to complete the training and certification process if you want to apply for EMT jobs and work as an EMT since it is required for EMTs and Paramedics to have a license issued by the state before they can work. There are several levels where an EMT can be trained and you have to start at the lowest level to reach a more advanced level of training. These levels include EMT Basic, EMT Intermediate, and Paramedic. EMT Basic Training: This level has the least requirement and least hours of training required. 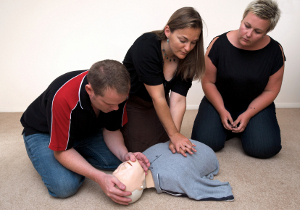 You will learn emergency basic life support skills for trauma, respiratory and cardiac problems. After the training you are expected to be able to assess the patient and identify various issues like cardiac, respiratory, and circulatory in an emergency response. EMT Intermediate Training: After you’ve completed the EMT Basic training and had some field experience as a certified emergency medical technician you can take the next level of training. The EMT intermediate level requires more hours of training and the requirements vary from different states. You will need at least fifty to three hundred fifty hours of training. EMT Paramedic Training: This level requires advanced training in anatomy and physiology. Paramedics need to learn skills in providing advanced life support during emergency situations. You can take paramedic training as part of the AS Degree in your community college. There are a lot of state approved schools offering EMT training courses as associates degree or certificate program in the US where you’ll gain knowledge on anatomy, physiology, prehospital care, and life support skills. You can get this list of approved EMT schools from the EMS office of the state where you want to work. Your chosen EMT training school should qualify you to take the NREMT certification exam. You can also find organizations and schools that offer EMT training for free if you can’t afford the tuition fee or you can just offer your time and volunteer as an EMT to get free training. You will need at least a high school diploma to get qualified for an EMT training. Although some states don’t require you to have them, most usually do and it’s better if you have them prepared. If you don’t have a high school diploma, you should prepare your GED instead. You are right to think that Paramedic and EMT jobs needs you to also be physically capable of lifting and carrying heavy objects, you must have good physical coordination and agility. You should expect to carry heavy medical equipment and be able to handle irregular shift schedules. You’re also required to have good vision and eyesight with perfect color vision or you can also use corrective lenses. Another important requirement is that you must be emotionally stable to be an EMT or a Paramedic. In fact, you will be faced with life and death situation and you should be able to stay calm and be able to make quick decisions. Most schools and employers will also check your background for criminal records. If there’s a conviction, the case will be reviewed by the EMS staff and state legal department if necessary. The EMT certification can vary from state to state, others have their own certification program but most states require and use the NREMT certification. You’re also required to renew your license every two or three years. It is generally required for EMTs and Paramedics to take refresher courses or complete a continuing education to keep their certification/license. Remember, the hours and level of training required depends on the EMT level you’re taking. Aside from the formal training, additional hands-on training for practical experience are done in hospital emergency department or emergency vehicles. You will be trained on different medical equipments like oxygen tanks, stretchers, backboards, splints and braces. You must pass a written exam and a practical exam to graduate from an approved EMS training program. You can use EMT study guides and EMT practice scenarios to help you prepare for that and get nationally certified. If you want to have more advanced EMT training, you must be state certified/licensed first as an EMT Basic and have some valuable work experience.